SALT LAKE CITY – He shot baskets with his brothers on the court here at EnergySolutions Arena while their dad iced his knees and custodians cleared the detritus of another Utah Jazz game. 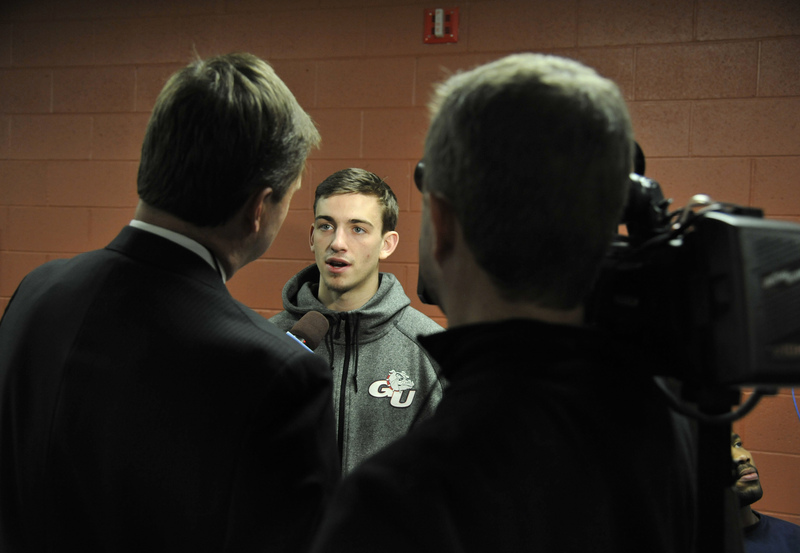 Maybe it was the trainer treating them to a Gatorade, or comparing shoe sizes with 7-foot giants, but for David Stockton there is a memory attached to everything in this building. That banner, this seat, that echo, this Coke machine. “I bet we walk right by it on our way into the building,” he said. Before they do, Stockton and his Gonzaga Bulldogs teammates will walk into the NCAA Tournament past the statue of his father, John, in the plaza at the arena’s southeast corner, commemorating a Hall of Fame career with the Jazz. But this is David Stockton’s Hall of Fame story. Tagging along with their dad to the office was, of course, a childhood perk for the Stockton kids, two conditions always applying: 1) be polite and respectful, and 2) stay out of people’s hair. There was not a “no rollerblading” rule. Initially. Early in the 1998 NBA season, John Stockton was rehabilitating a knee injury, so 8-year-old David and older brother Michael brought their skates to what was then known as the Delta Center to cruise the endless concourses and tunnels. And then they saw Everest – the tight, switchback ramps leading to the building’s upper deck, and grasped the possibilities of a daring descent. The pain was pretty fierce. The dread might have been worse. John Stockton’s first concern was going to be his son’s well-being, of course, but this was a definite violation of the stay-out-of-everyone’s-hair clause, as it interrupted a work day. “He was so mad he had to leave,” Stockton said. This 75th NCAA Tournament is as big a deal as ever for the Zags, being No. 1 seeds and all, but it’s undeniably just a little bit bigger for Stockton, seeing he’s back on his childhood playground and his father’s office, reliving the fun memories and even the fun-only-in-retrospect ones. Michael is otherwise engaged, playing professional basketball in Germany, and so will not join the family in a suite to watch GU’s second-round game against Southern Thursday afternoon. But he’s completely clued in to how much the moment means to his brother. It was an entrée into crazyworld, where the visiting superstars who spent 48 minutes chasing and body-checking Dad turned into their best buds afterward. One time, Michael breached the other team’s locker room and was quickly engaged by Charles Barkley, an Olympic Dream Teammate of John. When a TV crew interrupted to request an interview, Barkley insisted they let Michael ask the questions. “There’s video of that somewhere,” he marveled. So was that access ever taken for granted? But it’s not. Following his father to Gonzaga – where his retired number hangs above the court, as it does here – meant walking on and risking the possibility of, in Michael’s words, “eating dirt for five years.” Pressed into duty on a team with point guard issues in 2011, Stockton then had to carve out a new role when Kevin Pangos and Gary Bell joined the program last year. He’s made this one count, too. Even playing just 18 minutes a game, he leads the team in assists and steals. Though coach Mark Few has four different players who man the “3” spot, often as not he prefers to play three guards as a change of pace. A handful of GU games have turned on the efficiency of his offensive minutes. And if he gets a half dozen assists here this weekend, he’ll still be about 8,000 short of the arena record. But he’s made his own mark. This is no surprise to Michael, who played his college ball locally at Westminster, and whose intramural competitions with David and older brother Houston could get every bit as heated as Stockton driveway wars a generation earlier. Even when it’s been tough skating. Published: March 20, 2013, 6:03 p.m.